With only two of us able to stand watch, the long haul passages we did in the Caribbean proved tiring for us. We tried 2 hr and 3hr watches – just as we had on Army boats in days gone by and it worked reasonably well for short island hop passages. We were both used to it and doing stag is just doing stag after all! However, in all the longer passages we did, we quickly got tired. And I mean very tired. Need to sleep for a day to recover tired. We have only twice had crew. Once just for a night, Lou from BVI to St Maarten and then Vicky for a week, from Jamaica down to Panama. The difference to Lou and I having someone else we could trust to stand watch was huge. 2 hrs on, 4 off. You suddenly have the chance to catch up on sleep, to be able to do something other than sleep when you come of watch. Maybe even actually enjoy the sail! Back down to no crew as we couldn’t find anyone suitable, when we were contemplating the Panama to Galapagos passage, Lou and I decided to try something a little different. Lou and I have very different sleep patterns. Lou is a night owl and hates the morning. I on the other hand, far prefer an early night (she says its my age showing……cow) and am perfectly happy getting up at the crack of dawn. To that end we set up a modified watch system that allowed both of us to get what our bodies say they like. 1500 – 1900 Awake period. A mix of adults and kids. E and H will stand for periods up to an hour each (weather and sail plan dependant). Lou will doze. Dinner before last light. A note on the kids. As the kids have got older, we have asked the kids to stand more time on watch. Initially it was 30 mins just sitting beside one of us. As time has gone on, they have learnt how to use the autohelm, how to steer and critically to shout when they are unsure about something. 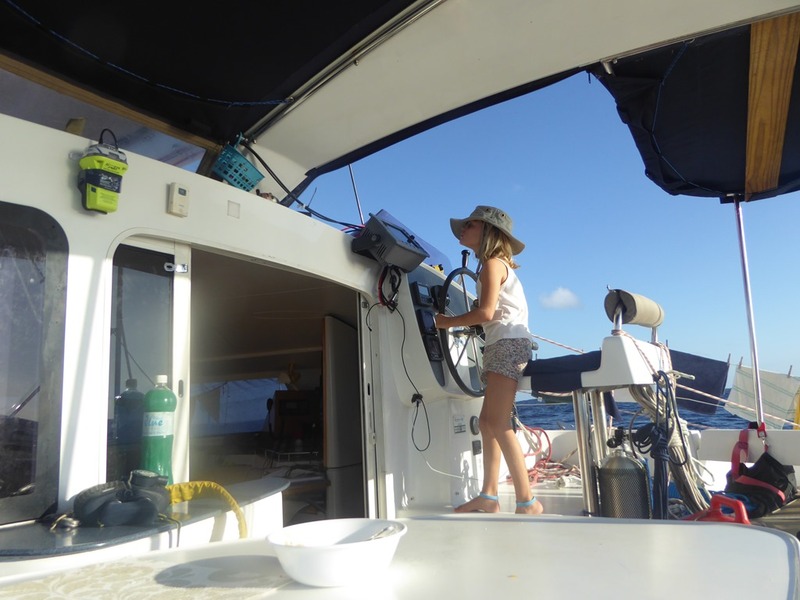 It is Eleanor on the helm when we reef these days – she has an excellent understanding of Go, No Go (thanks, Ernesto!) and where to point and balance the boat whilst we raise or lower the mainsail. These days they will stand an hour each at a time. Even if the hat seems a little big on them, both have been a great help. The hour here or there that they do just takes a bit of pressure of Lou and I. We have used this system successfully for the Galapagos and now the Pacific crossing. It isn’t perfect. If the weather is difficult, then we do both get tired and need to doze during the Awake period but it seems to work far better than what we have used before. We will have crew with us for some of our time in FP. 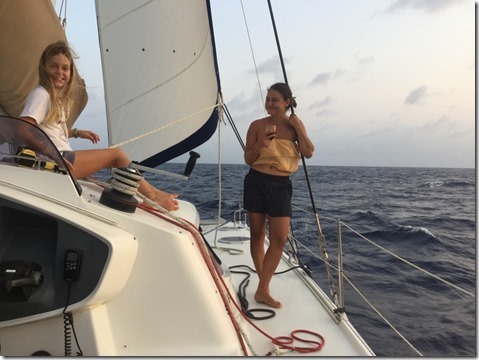 Mia from Taranga will join us for a month or so and we are looking forward to some more sleep as we island hop. However, as we move W and just the family on board again, we will come back to this system. We are happy with it.